Being the capital city of Punjab and the second largest city of the country, the importance of this place cannot be ignored. It not only has political or economical importance but also a long history attached to it as well. Old Lahore has a rich cultural background with buildings like Badshahi Mosque and Shahi Qila which have forever maintained its beauty. With all of this, it is also the 25th most populated city in the country which means that the infrastructure has to be maintained and kept up to the required level. A lot of people have governed this city and undertaken numerous developments which have made it the second best tourist destination in Pakistan, according to The Guardian. The area around Kalma Chowk is one of the busiest in the city because it has traffic coming in from different areas. Due to this heavy traffic, accidents and traffic jams became a common event for every day. Notice was taken and a flyover bridge was made for this area so that half the traffic could be given another route. It provides a quick way straight to ferozepur road without any stop in between which not only clears away traffic but saves a lot of travel time as well. On top of that, the designing has been awe inspiring and with the lights at night, it truly becomes a sight to watch. Lahore Ring road is an 85-km long road which links to the M-2 motorway and N5 National Highway. The roads and wide and ensure a smooth drive all along. Drivers are recommended to abide by the speed limits to avoid any mishaps. This project has helped organize the traffic in and out of the city and with the plants and green grass, looks extremely pretty as well. The fortress stadium was always been a place for shoppers and recreation activities but it never had a mall. Recently, the huge fortress square mall has been built with a modern design that accommodates hundreds of brands and a large food court. It has become a popular attraction for people who wish to beat the heat and enjoy their day in a fully air conditioned facility. We all remember the large pastures outside of Punjab university, all surrounded by 6 feet walls. Recently, however, the project which was in discussion finally was built and the area of the university was used to make a road that would connect Allama Iqbal town to Maulana shaukat Ali road. Previously when it took 20-25 minutes to get to the other side of the university, now it only takes as less as 7-10 minutes. This is Pakistan’s first rapid transit system which connects areas from Gajju Mata and Shahdara. It has forty five fully air conditioned buses running on an overhead bridge that has been designed specifically for this bus service. It is a very cheap mode of travelling and has made the lives of poor people really easy, as they no longer have to walk the distances. This 2655 meter long flyover is one of the longest in Pakistan. It has contributed massively in ensuring a more managed traffic in the city of Lahore. 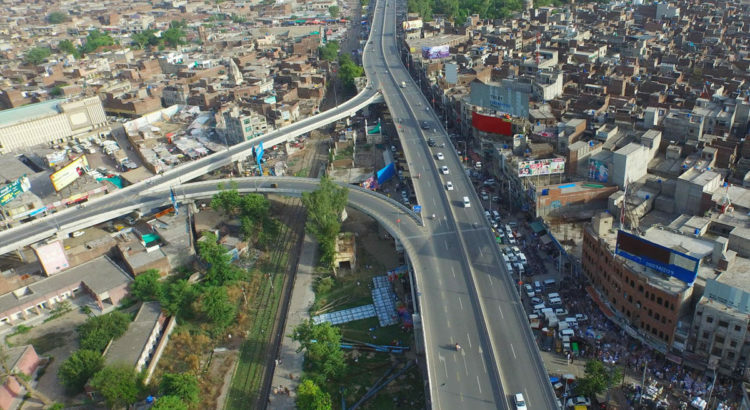 The flyover passes over the Canal road all the way to the road that connects Wahdat road and ferozepur road.